Yesterday I went to a dog show near San Remo - about 40 minutes along the coast in Italy. San Remo is a beautiful Belle Epoque town, not that I took any photos as it was falling down with rain. The dog show was held in the covered flower market at Arma di Taggia. 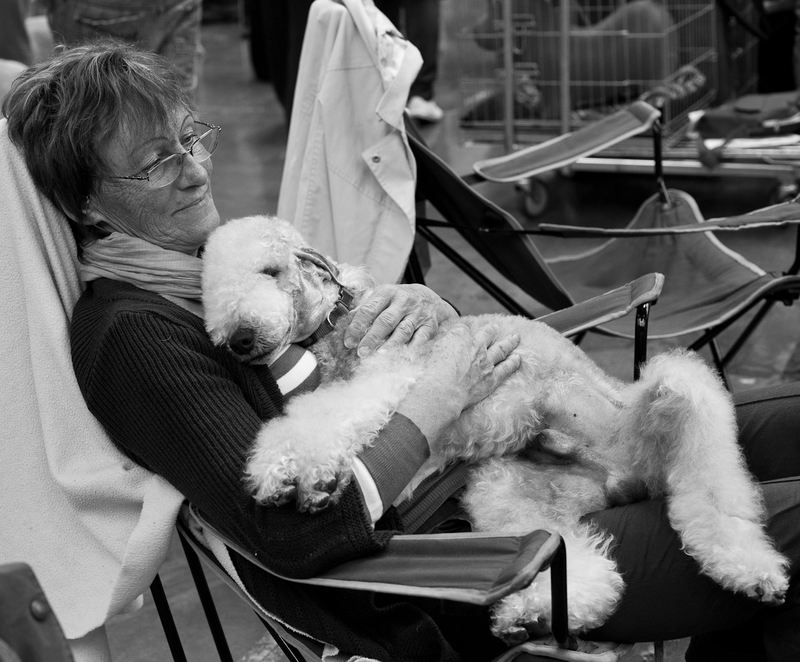 Whether or not this Bedlington terrier won his class seems irrelevant - these two have each other and that's all that matters. Hier je suis allée à une exposition canine à proximité de San Rémo - environ 40 minutes le long de la côte en Italie . San Rémo est une jolie ville de style Belle Epoque , mais je n'ai pas pris de photos car il pleuvait . L'exposition de chiens a eu lieu au marché aux fleurs couvert à Arma di Taggia . Peu importe que ce Bedlington terrier soit ou non le vainqueur de sa catégorie, ces deux-là sont faits l'un pour l'autre et c'est l'essentiel. aw, jilly. i love this image so very much. i know exactly the solid weight and velvety feel of a bedlington terrior. and the woman's expression....priceless. A wonderful shot Jilly. The lady's face seems an amazingly content one.